From Tuesday 17th through the 22nd, during the Salone del Mobile, Lladro showcases at the showroom of Milano its spring/summer collection integrated into lifestyle proposals in a perfect combination with Boca do Lobo furniture: two brands for one unique lifestyle. Take a look at these Exclusive Lifestyle Presented by Lladró and Boca do Lobo! Lladro unveils its new introductions once again focusing on innovation and design. The historic artistic porcelain brand, one of the greatest brands of Spanish luxury, presents a selection of new creations in different categories together with the unique designs of the prestigious Portuguese firm Boca do Lobo. The visitors to the Lladro‘s showroom will have the opportunity to see creations such as the spectacular Winged Fantasy-a limited edition of 250 units, the geometric Panthers of the Origami series conceived by the creative laboratory, Lladro Lab as well as the Paradise Vase – the biggest and most complex vase created to date by the historic art porcelain brand. They will discover the Moments tables, small home jewelry or the elegant Jamz lamps, inspired by the essence of jazz; both collections are also comprised as part of Lladro Lab’s creations. All these creations are perfectly integrated into micro vignettes composed of luxury furniture of Boca do Lobo, and allow us to discover the incredible decorative language of both firms that highlight an exclusive lifestyle in design terms. The inauguration’s party will be on April the 17th, from 18:00h to 22:00h. Furthermore, Lladro is pleased to announce its presence at Salone del Mobile 2018, the international trade fair of reference for the world of design, during which you will discover its latest proposals in handcrafted porcelain for Lighting and Interior Design. Inspired by the Swan Lake Op. 20, ballet composed by Pyotr Ilyich Tchaikovsky, Odette Sofa tells the story of a princess turned into a swan by an evil sorcerer’s curse. 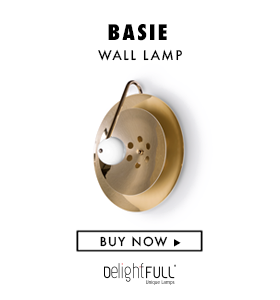 Its sweeping silhouette is accentuated with a polished brass structure and an asymmetric back offers a sophisticated design and timeless appeal. Designed in Boca do Lobo’s quintessential style, and influenced by natural elements, as well as artisan furniture making techniques, the Monet center table is a unique and sophisticated furniture piece. Resorting to the use of contrasting design elements and materials, Boca do Lobo have achieved a beautifully balanced center table which comfortably sits in any contemporary setting. Pixel is an effort to honor the union between design and craftsmanship. The 1088 triangles that complete this piece carry the dedication and art of those who built it – with a diversity of finishes never seen before. The polished brass base gives Pixel a unique personality, a strong and at the same time sophisticated character. The Lapiaz side table is a true luxury furniture piece, that boasts elegance and discerning taste. Inspired by the karst formations and cracks found on the surface of limestone and dolomite rocks, the Lapiaz features a minimalist geometric exterior surface, which by contrast is met with an organic and rich inside. Its reflective surface, made from a clean-cut mirror, and brass sheets guarantee an inexplicable attraction, which fills any space with energy. When art becomes a sideboard your room acquires an evermore-inspiring atmosphere. The Mondrian sideboard is more art than utilitarian furniture. Undoubtedly, it constitutes a unique and collectible object that is different from anything else and exudes a sense of both experimental design and luxury. Defying laws of physics, this futuristic piece of furniture has been designed by taking inspiration from its elder brother – Newton dining table. Newton console is a standout piece of international desire that distinguishes itself from all the other designs by its futuristic forms.